It's wall-to-wall Shakespeare this year as we mark 400 years since his death, and companies are doing their best to ring the changes by programming some of the less frequently performed works. One such is The Merry Wives of Windsor, a comedy said by some to have been written to please Elizabeth I who wanted to see something else with Falstaff in it. 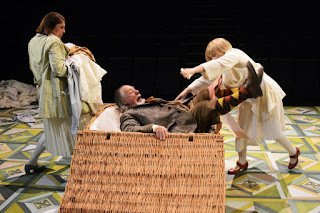 The Merry Wives has become far more popular in various operatic adaptations from Verdi to Vaughan Williams, and there’s some reason for this, as it is hardly the strongest of Shakespeare’s comedies. The plot is a bit on the thin side and its characters can become caricatures, but it is a jolly romp nonetheless, so a seemingly good choice for Northern Broadsides who do like to keep things lively. It’s also a return to something more in their house style than their astonishingly well-crafted Lear a year ago or the wonderfully imagined Winter’s Tale last autumn. This is vintage Barrie Rutter, playing the part of Falstaff not for the first time. The bluster and bombast of the character could have been written for him, although somehow he doesn’t quite achieve the pathos that exists in the part quite as he did in his understated Lear. Rutter directs a fine cast on a sparsely decorated stage, which suggests art deco in its wooden trees, helping to place the action in the 1920s. “Windsor” has been omitted from the title for this production, which sets the play somewhere above a line through Liverpool and Mablethorpe. The fops and flappers have a variety of accents suggesting a generic, affable northernness. Strong performances come from Tom Dyer Blake and Andrew Vincent as Shallow and Ford and Adam Barlow, Jos Vantyler and Ben Burman as Nim, Slender and Pistol. The show belongs, however, to the Merry Wives themselves, played with unrestrained glee by Nicola Sanderson and Becky Hindley. Not the finest piece of Shakespeare you’ll ever witness, but the writing sees to that, and apart from a few saggy episodes the whole thing trips along as merrily as the title decrees, and it makes for an enjoyable evening.